SW8NAC, Anna and SW8NAG, Nick ... new hams on Zakynthos Island! Big day today. Two young kids became Radio Amateurs today 27 Oct 2009. 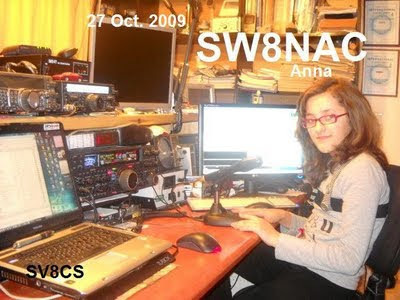 My daughter Anna (12 years old) is now a Radio Amateur with the callsign SW8NAC. Also the son of my best friend George (SV8RX), Nick (13 years old) became also radio amateur today with the call SW8NAG. I am very glad for this hapening. My daughter Anna (SW8NAC) now is the 3rd radio amateur member in the family. Thomas my son is also Radio amateur (SV8KOS).